Last weekend two groups of forum members from Hiking Advisor went for a snowshoe overnighter through the Belgian Hautes Fagnes. Me and five other enthusiasts chose a longer trip through the unspoilt valley of river Helle and along the burnt trees of Geitzbusch and Noir Flohay which are still standing like ghosts in the fenns after the wildfire of 2011. We broke trail once more along river Statte and had an exciting wild camp in the forest along this little river. 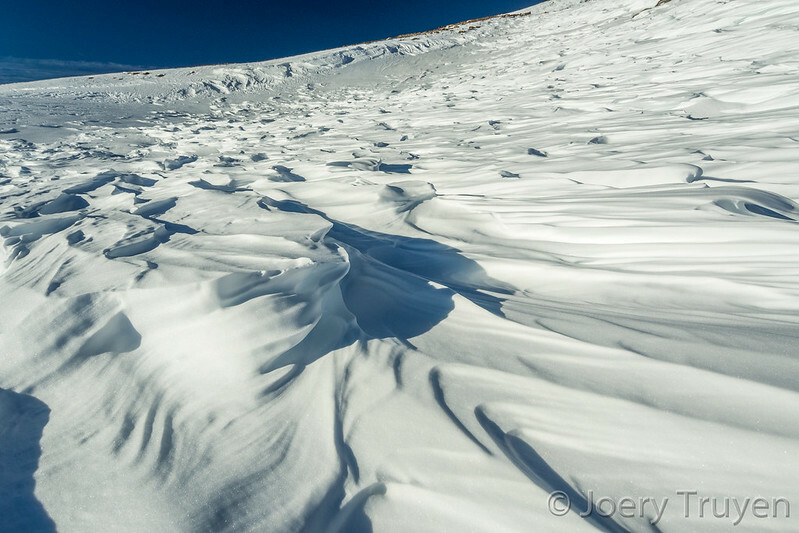 The next day we ascended the plateau again through the valley of river Hoegne and searched our way through long lasting snowfall back to our starting point at Centre Nature near Belgians highest point of Signal de Botrange. 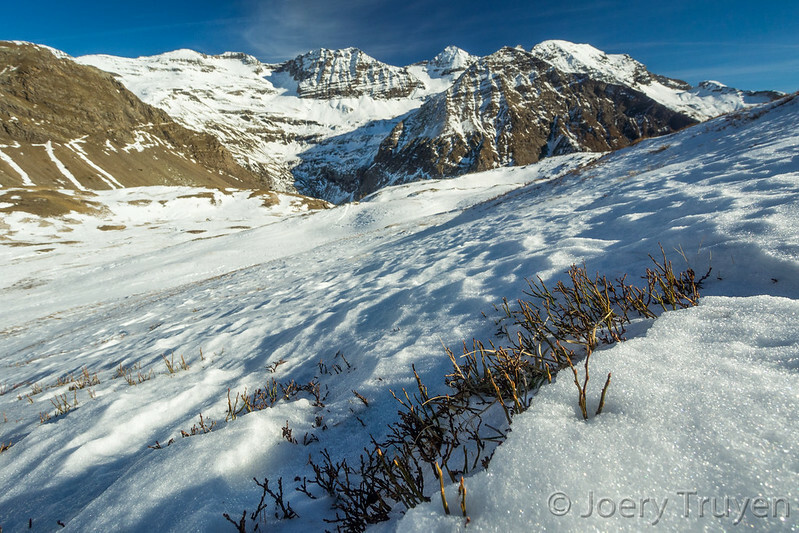 It had been snowing a lot earlier during the week and snowshoes proved to be indispensable on the higher grounds. There is nothing better than spending the weekend in good company and in a wonderful surrounding to get in shape for my upcoming trip through Patagonia. Early December and I had a few days time to make a winter trekking. 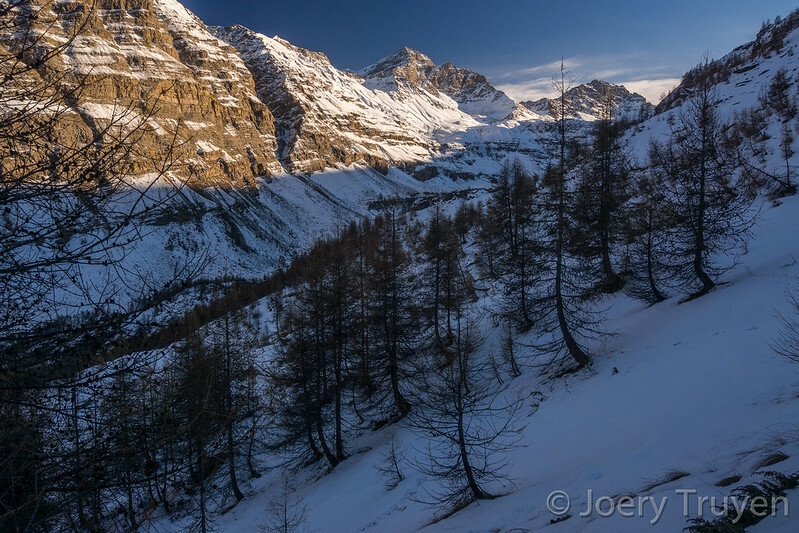 Not that much snow yet this year in the Alps but the weather seemed to stay splendid in the French Alps and so I decided to pay a visit to the National Park of the Ecrins. 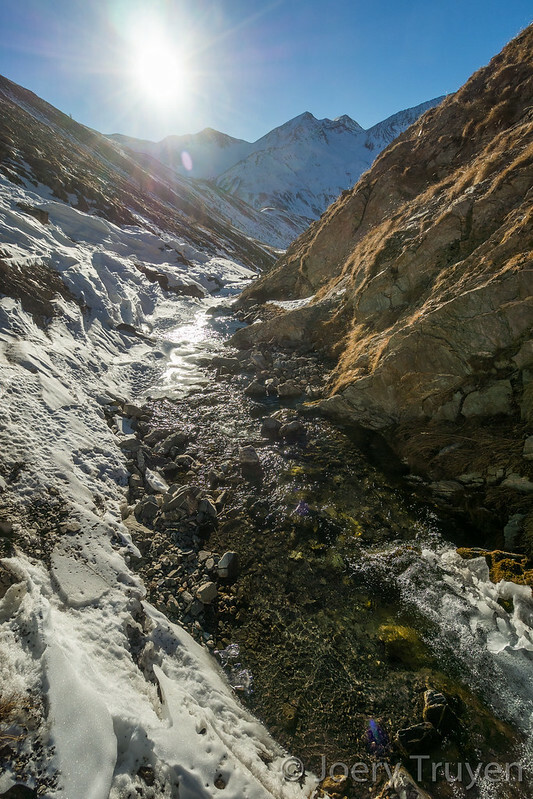 Due to the cold spell since last episode of snowfall a week earlier, snow was lingering to even the bottom of the lowest lying valleys. 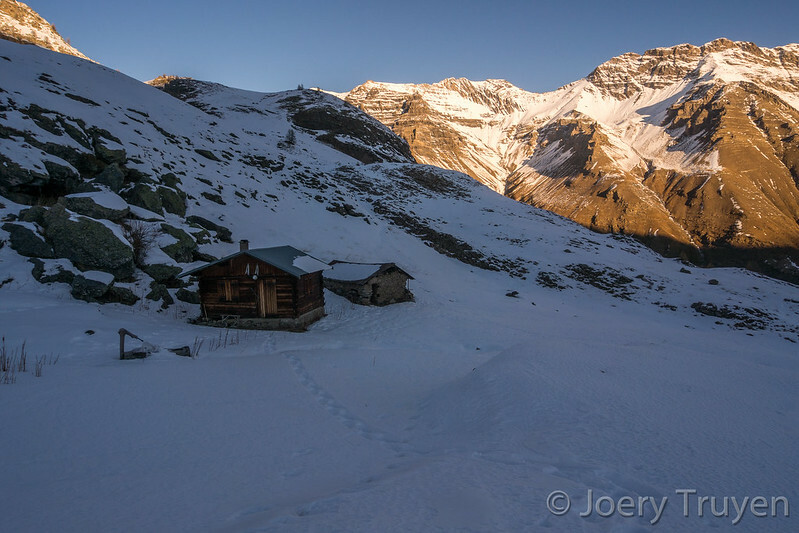 The south facing slopes that usually bath in the sun for most of daytime near Prapic (1550m), the mountain hamlet where I started the trip, had become snow free again but once above about 2300m a nice white wonderland seemed to be awaiting me. 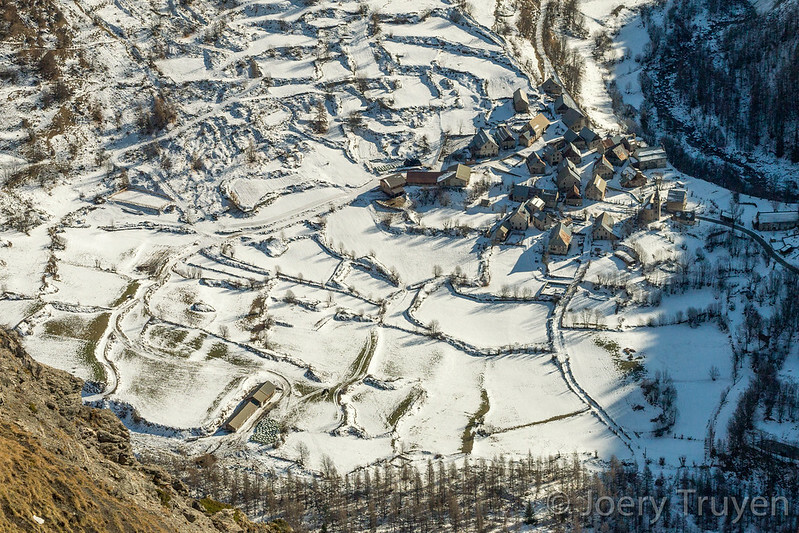 The mountain hamlet of Prapic (1550m) down below. 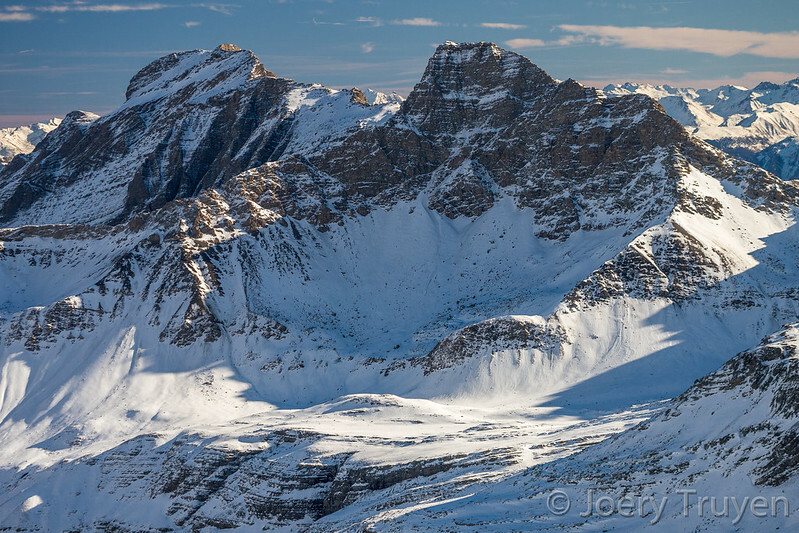 Not yet that much snow in the mountains. 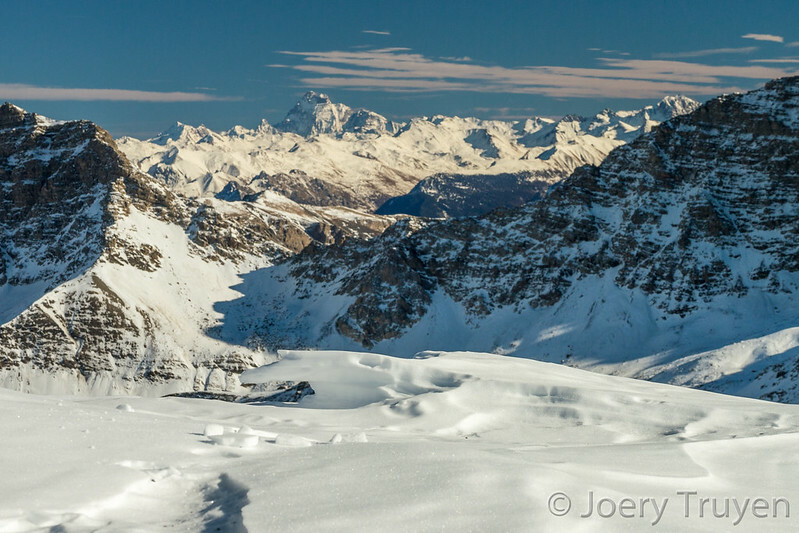 Looking back to frozen Lac des Estaris (2560m) from Col des Freissinières (2782m). View back to Col des Freissinières (2782m) while climbing Roc Diolon (3071m). 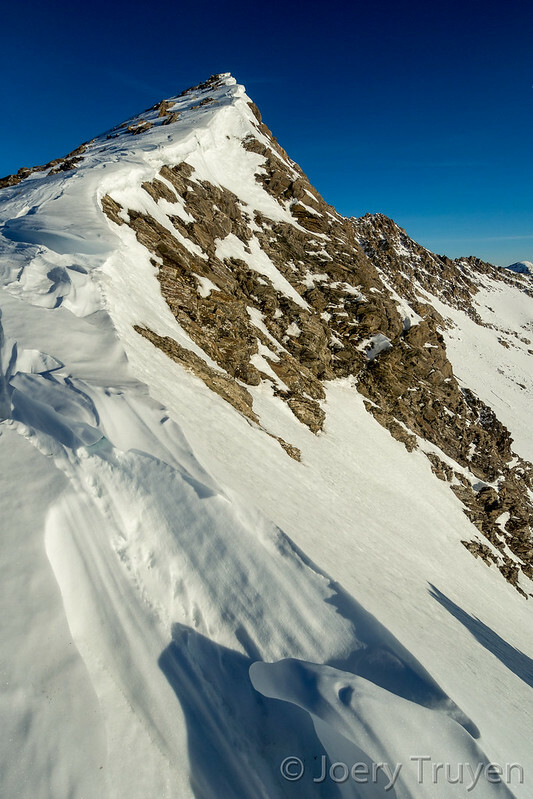 The way to the summit of Roc Diolon (3071m). I was experimenting with a pair of neoprene cycling overshoes over my trailrunners on this trip to keep my shoes dry and my feet warmer. The top of the overboots don’t have a close fit around my lower shin. Not enough time anymore before I left to sew an appropriate gaiter onto the overboots and by coincidence (or I can better admit that I’m not that organized) I didn’t find my second gaiter in my closet at home to wear over the overboots and so I eventually left without gaiters. I would be walking on snowshoes for most of the time and seen the recent weather evolution and the limited amounts of snow, I was probably not going to be missing my gaiters that much. It was not ideal but I wasn’t really worried. I still could bent my socks over the top of the overboots, a makeshift that seemed to work sufficiently. The bivouac spot on the ridge at around 3040m altitude. 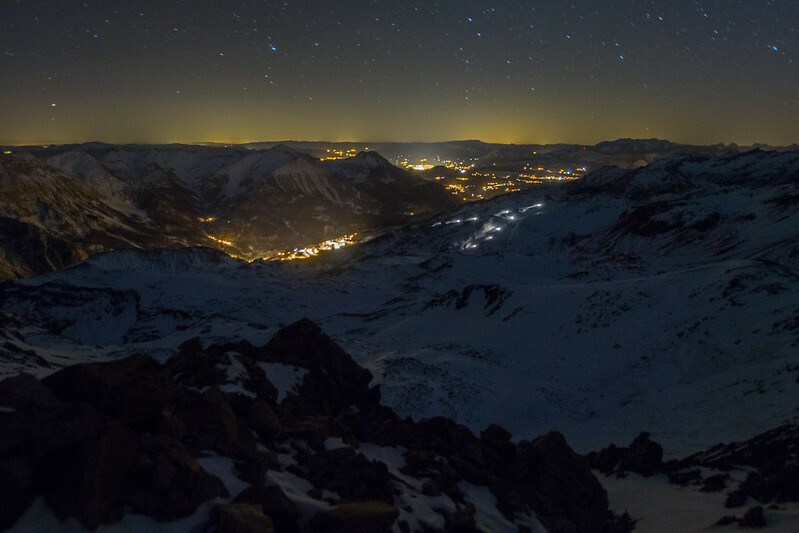 The Champsaur valley and the ski resort of Orcières-Merlettes from the summit at night. 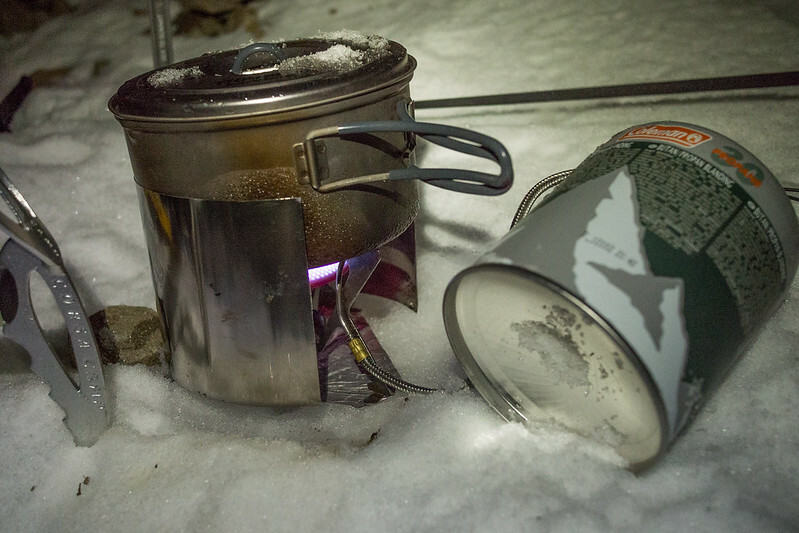 Melting snow for supper in the tent after the avoided disaster. 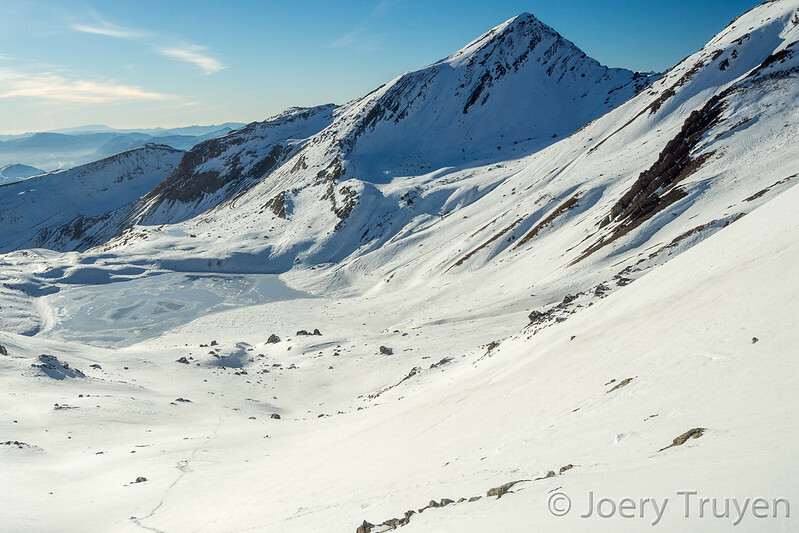 I gained altitude on the zigzag path above Prapic, then headed north over the snow covered terrain near the closed ski resort of Orcières-Merlette to reach the frozen mountain lake of Grand Lac des Estaris (2560m) around noon. I had been walking on microspikes since I touched the first crusted snow, but from here I had to put my snowshoes on to reach the Col des Freissinières (2782m) over the deep wind driven snow accumulation that had been blown trough the mountain pass. The climb to the mountain pass ended in a short steeper section with a slope up to around 35°. From the pass I looked down into the deeps in the valley head of Val des Freissinières at the other side. Descending the pass over here looked steep and didn’t seem to be without avalanche danger, but that would be for tomorrow. 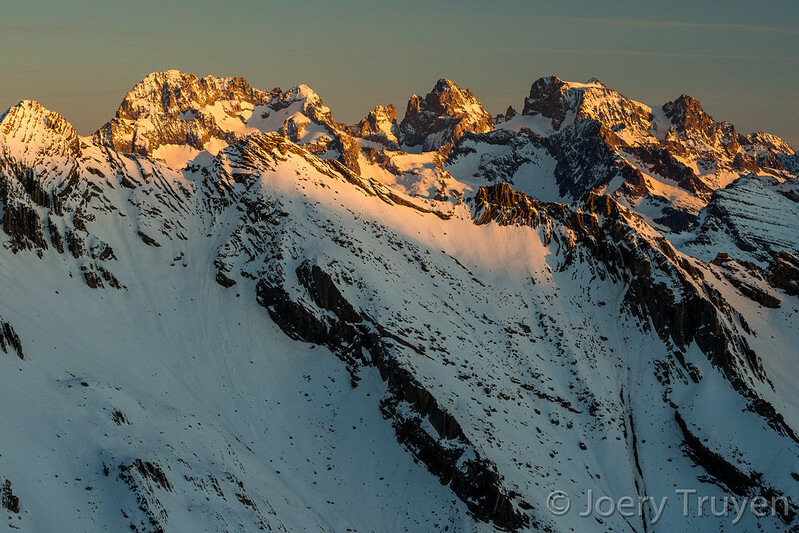 The highest peaks of the Ecrins including Barre des Ecrins (4102m) from Roc Diolon just before sunrise. Awaiting the sunrise at the summit cairn. The modest sunrise behind a veil of high clouds. 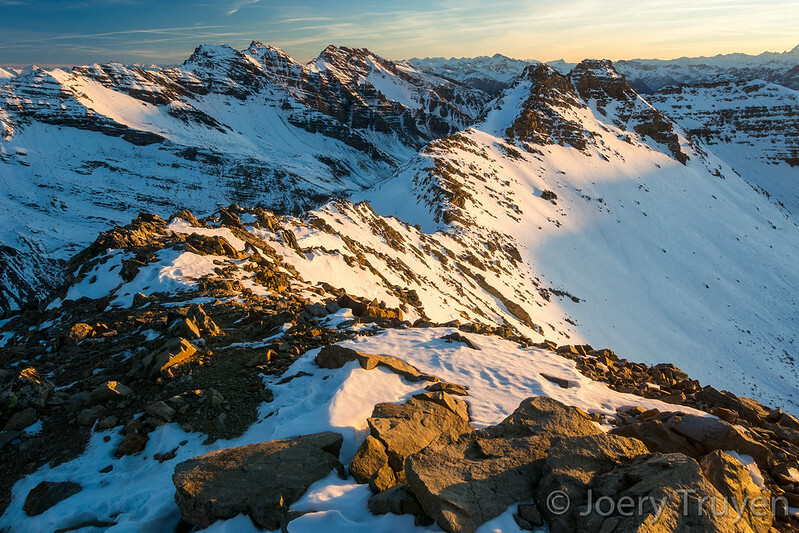 First sunrays hitting the highest peaks of the Ecrins. 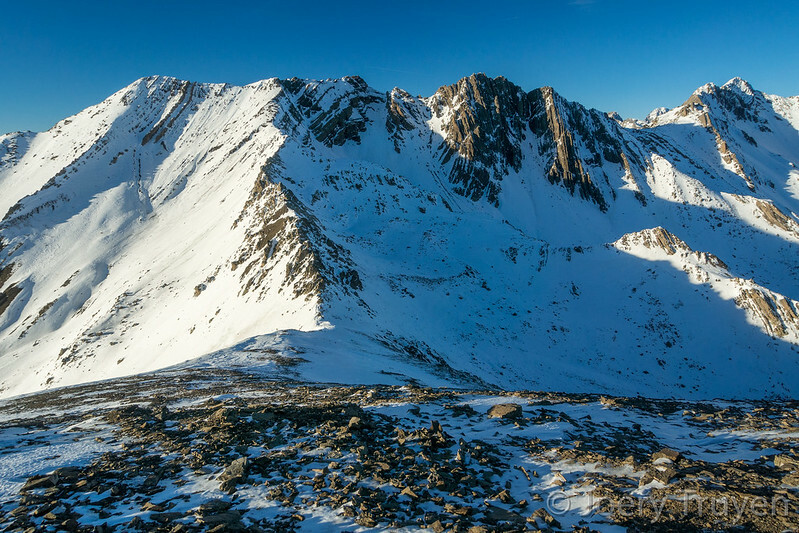 I exchanged snowshoes for microspikes again and turned south on the pass to continue to gain altitude on the mountain ridge over hard icy snow. After a while I reached the summit of Roc Diolon (3071m) without much effort. The sun was now already low above the horizon. I enjoyed the summit views for a while with especially the 4000m peaks of the Ecrins in the north that impressed the most. 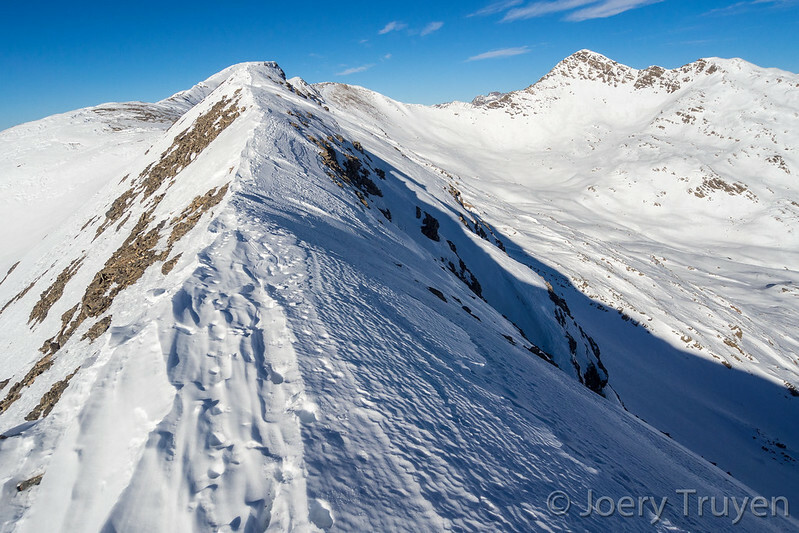 The east ridge of Roc Diolon with Tête de Soulaure (3243m) in the background. 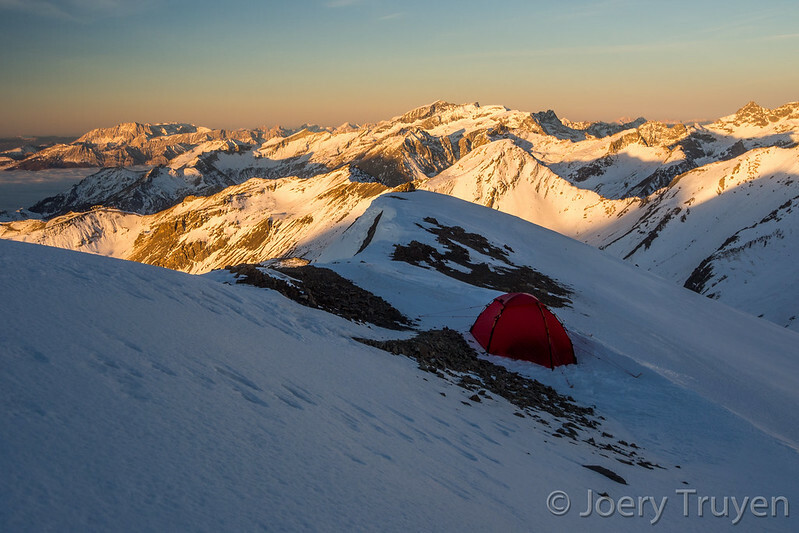 The perfect spot for a ridge bivouac, Vieux Chaillol (3163m) and the Devoluy mountains in the back. Hardly a breeze on the summit, ideal conditions to make a high altitude bivouac as planned. 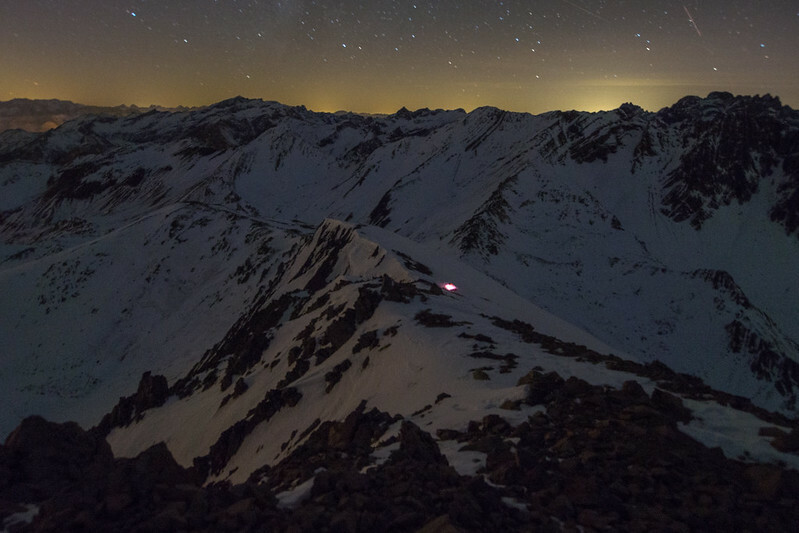 If possible I would have pitched my tent on the summit but that seemed to result in an uncomfortable nights sleep. 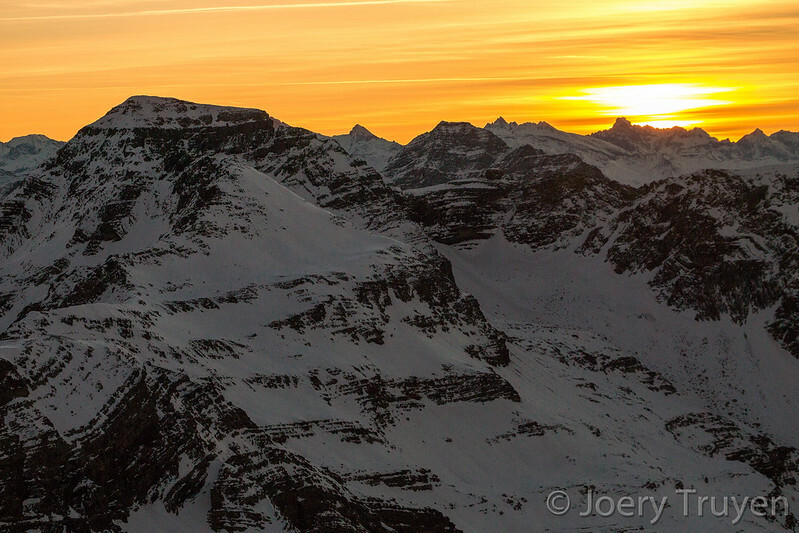 About 30m below the summit I found a perfect spot and pitched the tent while the sun went to sleep behind the horizon. 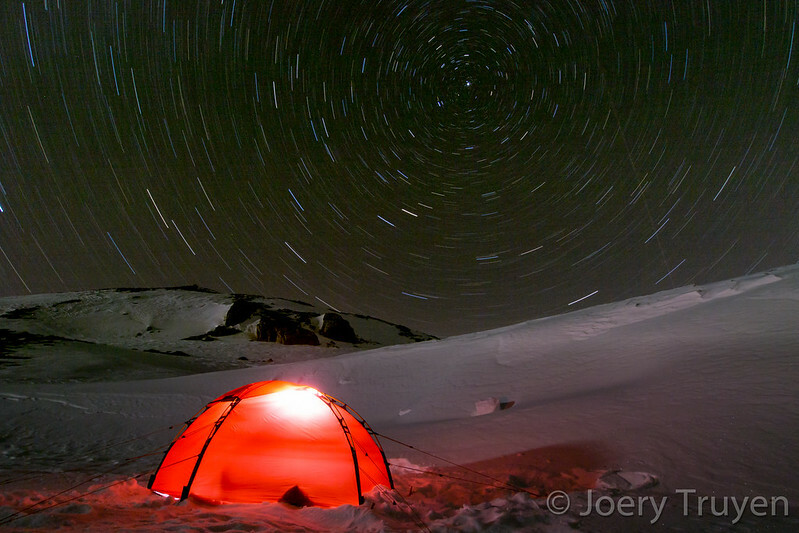 The wind picked up at night to a steady moderate breeze and maintained a constant -8°c inside the tent. The view while descending down Col des Freissinières into the valley with the same name. Looking back to Col des Freissinières and Crête du Martinet (3104m). While melting snow for supper it started to smell suspiciously like propane gas inside the tent after a while. I checked my burner and gas canister and then suddenly noticed that liquefied gas was squirting out of the rotary valve on the gas canister. I was using my MSR Windpro burner in inverted liquid feed as I had always done before without problems. While turning the canister to close the valve, the leaking gas caught fire and I now had a burning bomb of a gas canister in my hands! In panic I started to knock the flame with my hands (while wearing mittens luckily) but the flame only got extinguished once I realized after a few seconds that I better just could close the valve. What a relief when the flames died, my heart yet beating as hell. Fortunately I had left the tent door opened. If not, the tent fabric could have caught fire. I had checked the gas burner at home before the trip and it had worked fine than. When I lit the burner again I found out that the rubber around the lever seemed to have worn too much and did not entirely seal the valve anymore. As long as I did not turn the lever too abruptly the leaking hold off. Still this is unacceptable for me. A gas burner should remain safe at all times, even when some sealing rubber would start to wear off. Anyway, I eventually had a good meal that evening but a few holes had been burned in my mittens though. 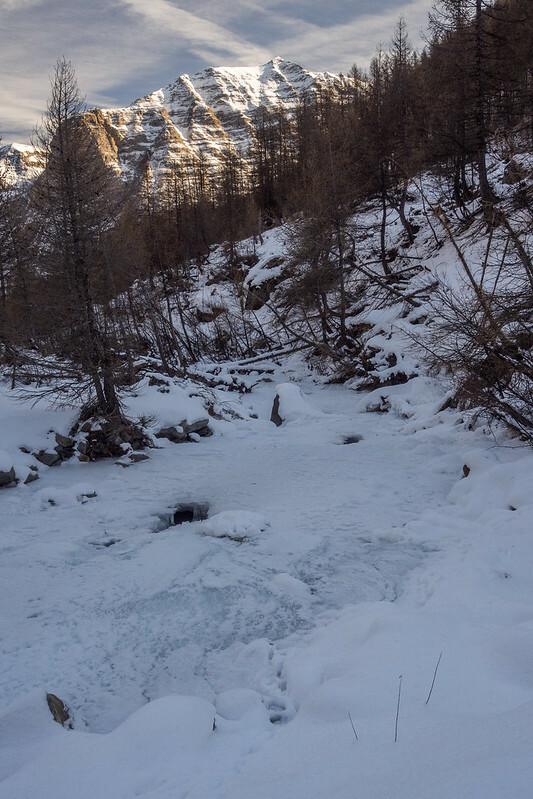 The frozen river at Val des Freissinères while approaching Dormillouse. Reaching the tree line again while climbing to Cabane de Palluel, Pic de Rochelaire (3108m) and Tête de Couleau (3038m) in the background. 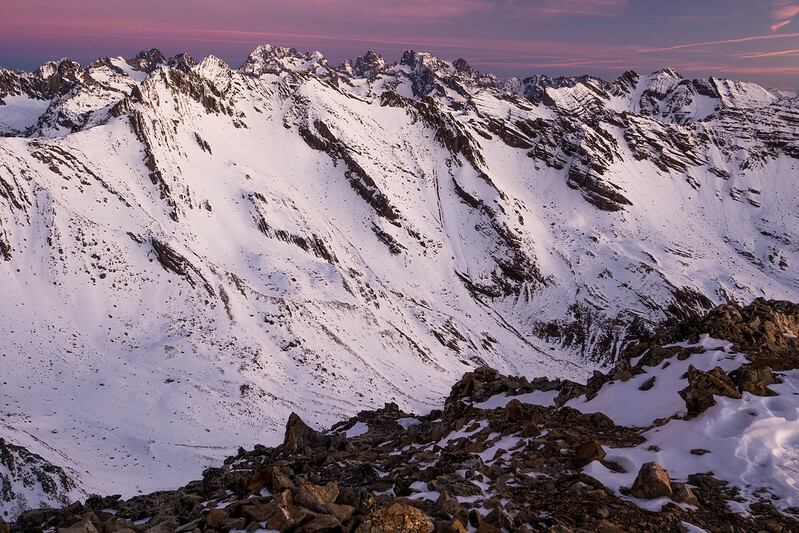 I climbed to the summit again during the morning and awaited the sunrise which led to a very short lived morning glow on the surrounding peaks. The nocturnal breeze faded away as the sun rose and I packed my stuff in a deadly silence… as long as there was no jet plane flying overhead at least. 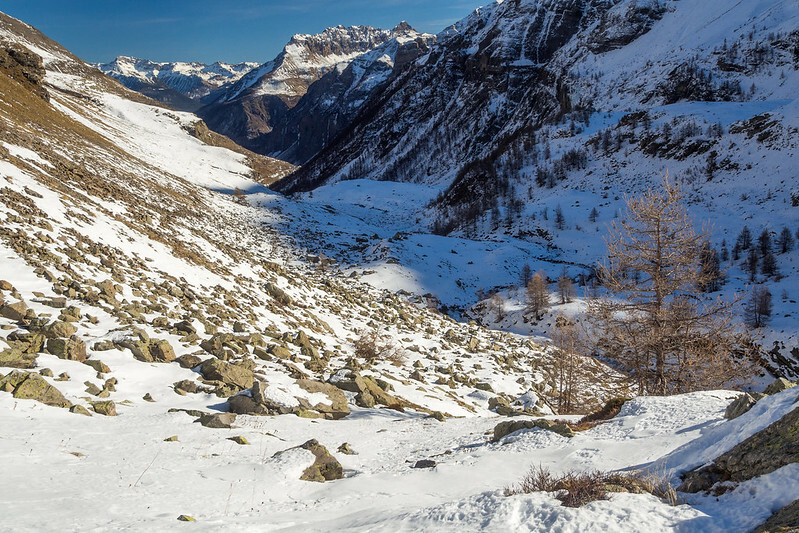 When again arrived at the Col des Freissinières I put crampons on my feet and took my ice ax from my backpack and descended steep down into the valley over crusted snow between outcrops of rocks. Finally on flatter terrain I continued over mostly portable crust but suddenly fell through the snow in a deep hole onto what seemed to be a boulder field underneath and while hitting ground a point of a crampon pushed into the femur of my other leg. I climbed out of the hole and checked my leg. Despite there was no hole torn in my pants, I still felt a lot of pain for a while and noticed a wound on my leg, slightly bleeding but not troublesome enough to stop me from walking deeper down the valley. 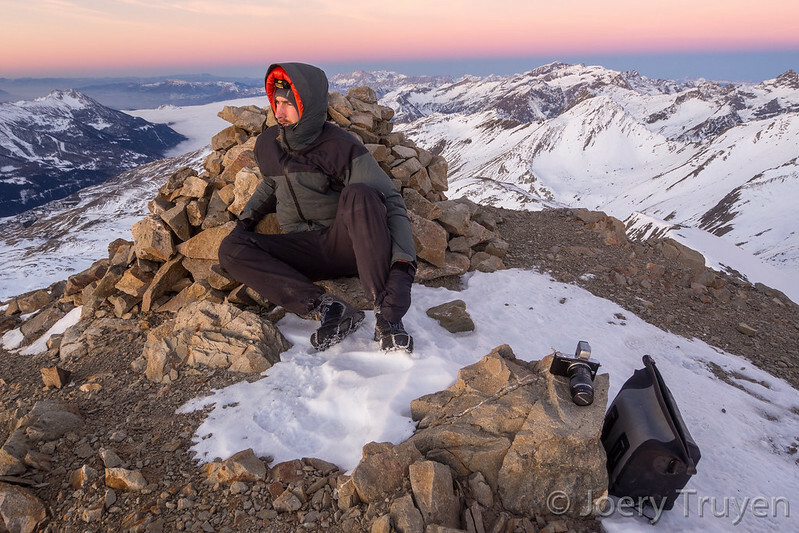 Morning at Canabe de Palluel (2173m). 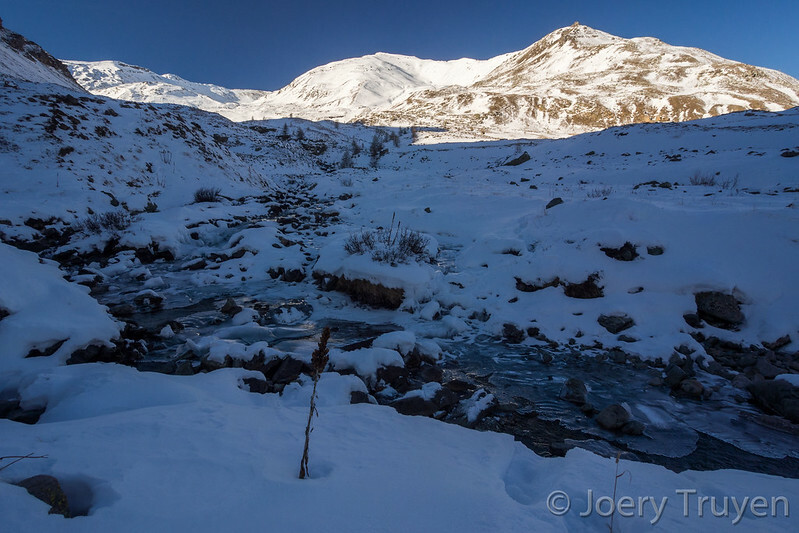 The mountain stream slowly freezing, Le Tuba (3008m) and Petit Pinier (3100m) in the background. 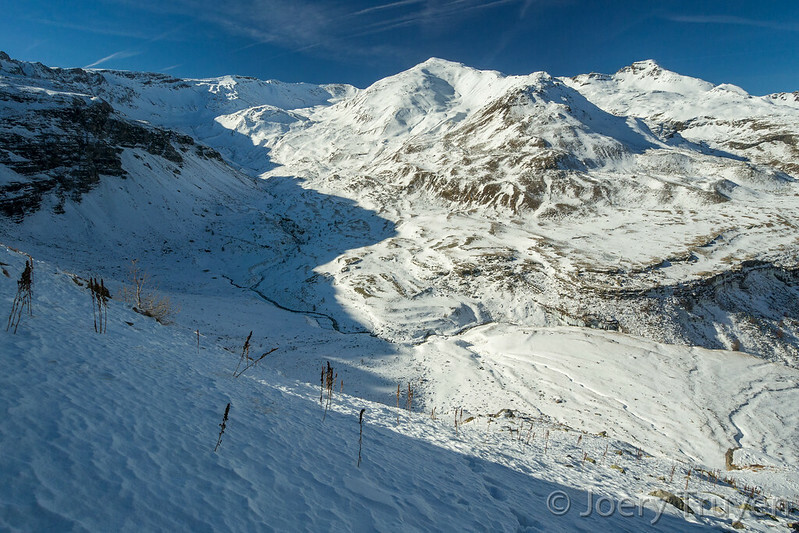 A steep climb out of the valley, Le Tuba (3008m), Petit Pinier (3100m) and Grand Pinier (3117m) at the horizon. Val des Freisinnières is yet one of those quite wild and remote looking valleys in the Alps which you don’t find that much anymore these days. Deeper down the valley the winter sun didn’t reach the valley bottom and progression became more tiresome through a half a meter of powder. 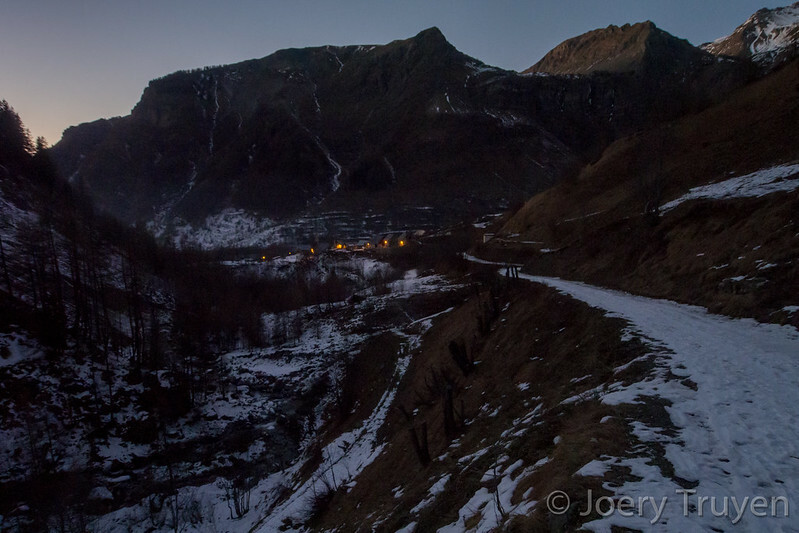 It took me till late afternoon to reach the hamlet of Dormillouse (1727m), now abandoned during winter. From here I crossed the river and climbed over the summer trail in the forest which leads to Lac Palluel. I climbed above tree line and stopped at Cabane de Palluel (2173m) before reaching the mountain lake. The shepherds cabin was now locked for winter but I found an easy way to get in. I cautiously melted snow with my own burner inside the cabin and now managed to limit the gas squirting of the burner to a minimum. 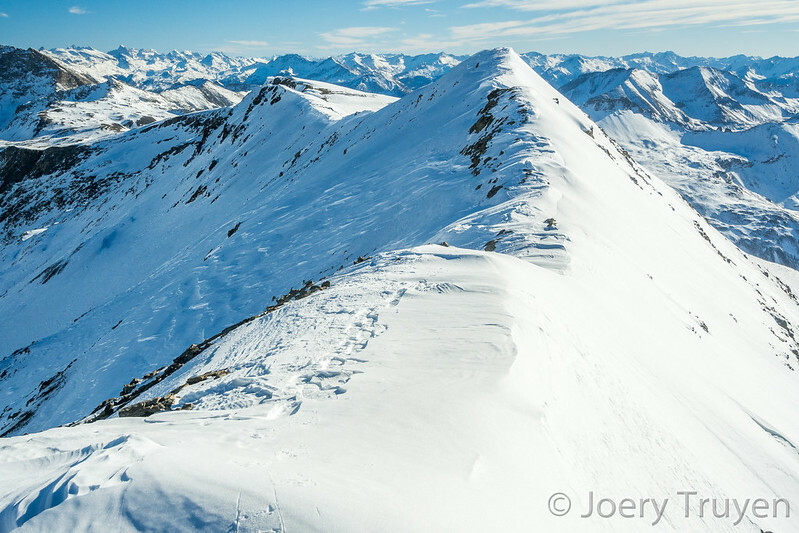 Overlooking the terrain towards Col des Terres Blanches (2721m) and Tête de Couleau (3038m). 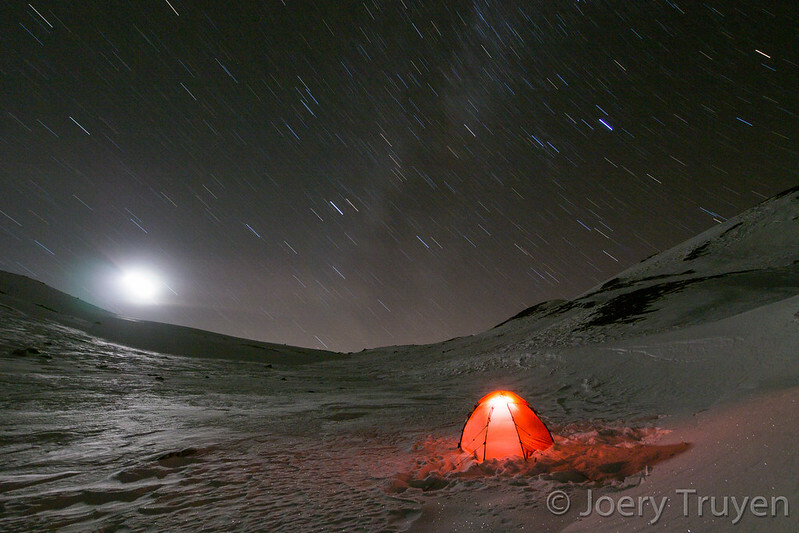 Moon and star trails at the bivouac spot near Col des Terres Blanches (2721m). Later during the night I was mostly awake in the cabin, too warm inside and the usual uproar of mice kept my out of my sleep most of the time. 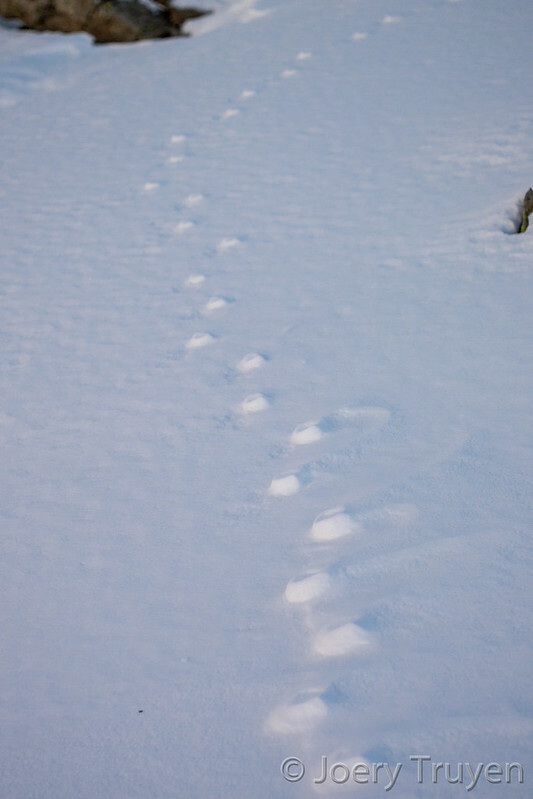 The next morning I left early after sunrise and created my own traces in the snow while searching a route to Grande Cabane de Faravel (2204m). 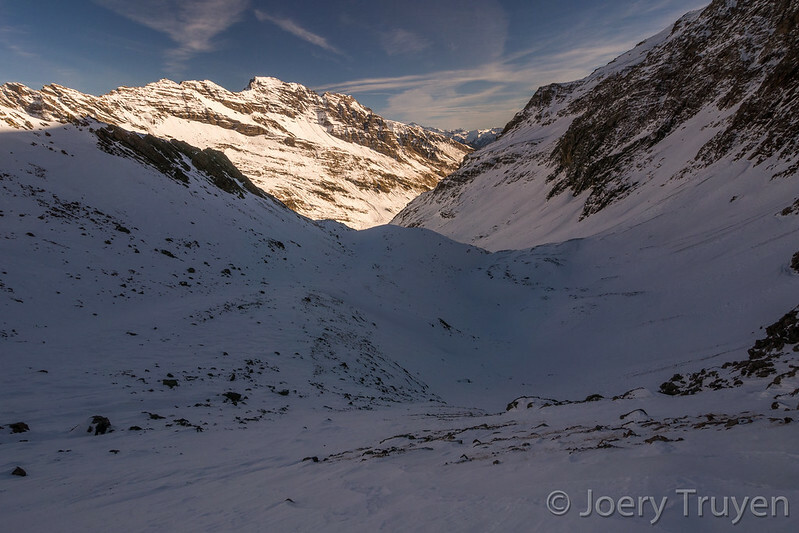 From there I could descend down to the valley bottom and climb along the eastern slope of the valley passed a steep rock face to reach a high mountain valley under Col des Terres Blanches (2721m). 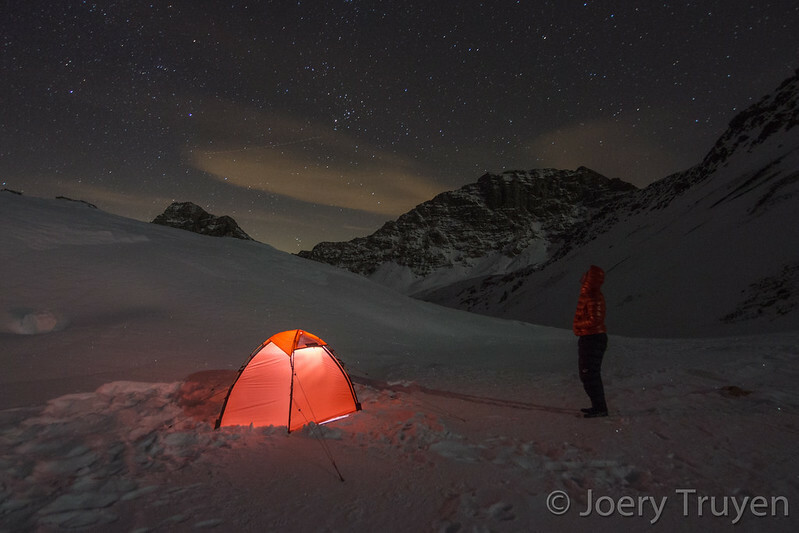 I pitched the tent just below the col that evening and enjoyed the starry sky for almost two hours before searching for my sleeping bag in the tent. Local zastrugi formation at Col des Terres Blanches (2721m). 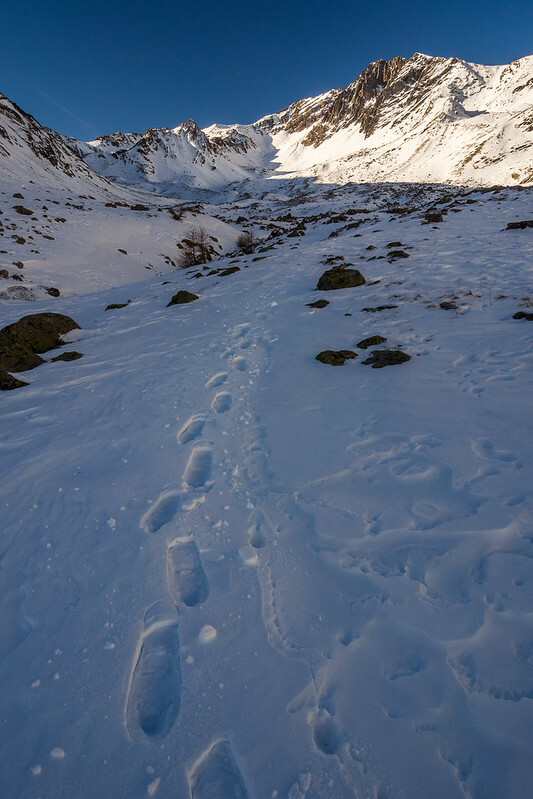 Footprints of chamois and snow grouse lead me towards the summit of Le Tuba (3008m). Pic de Rochelaire (3108m) and Tête de Vautisse (3156m) seen from le Tuba (3008m). Ridge walk back to Col des Terres Blanches (2721m). A distant view to Monte Viso (3841m). 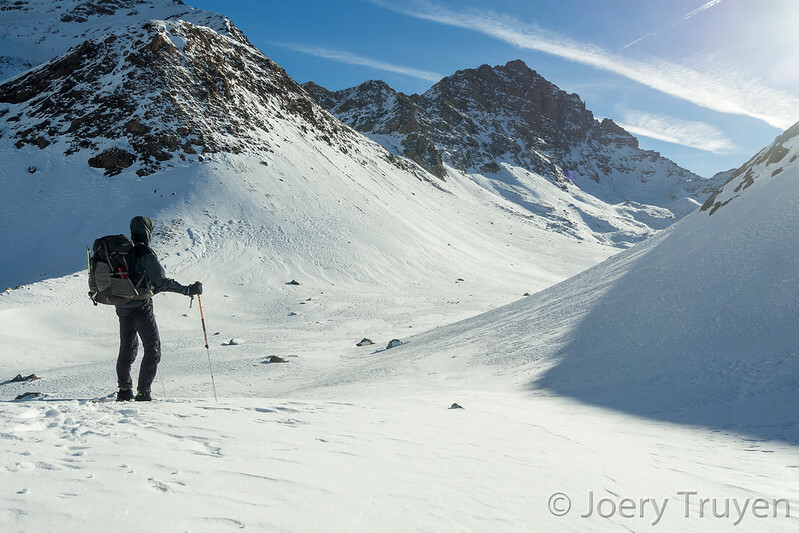 The last day included a long ridge snowshoe walk towards the summit of Le Tuba (3008m) where I enjoyed a long pause to admire the surrounding peaks. Back at Col des Terres Blanches I started the final and long descend back down to Prapic. Along the way I encountered a couple of chamois that seemed to be playing tag with each other. When I arrived at Prapic it was already dark and night while the stars started to appear in the sky. The beautiful trip had come to its end. 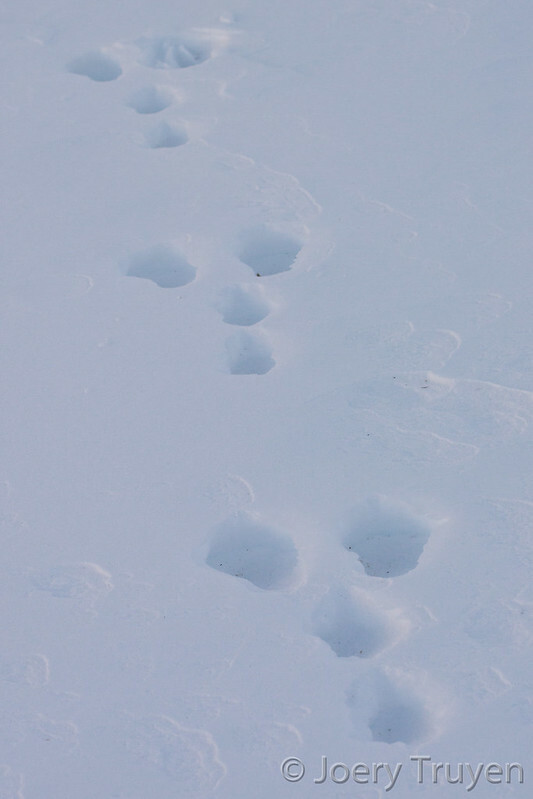 Snowshoe hare, where are you? Following the deep incised Torrent de la Bruyère below Col des Terres Blanches. The last bits to Prapic (1550m). The first snow of winter over the Belgian Ardennes appeared last week. Today everything is melting away again. 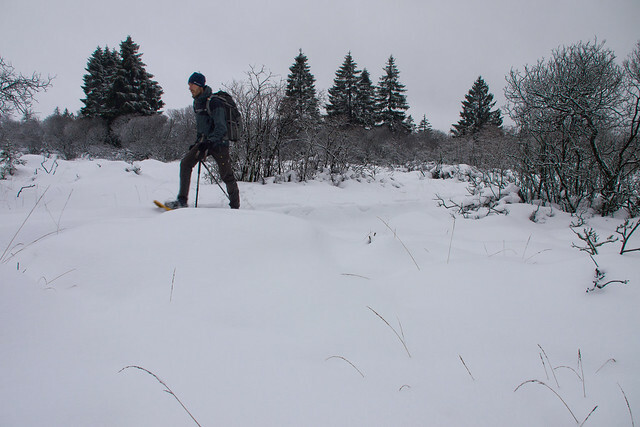 Luckily I found the time to make a dayhike on the Hautes Fagnes before the thaw set in, snowshoeing on the plateau and hiking on trailrunners on the snow in the Rur valley where the snow was only a thin cover. Beside a lot of people seem to have visited the area last weekend, I was breaking my own trail on virgin like snow deeper on the plateau. No single other hiker crossed my path. So I like it best. Descending to Monschau along the stream Klein Lauf. 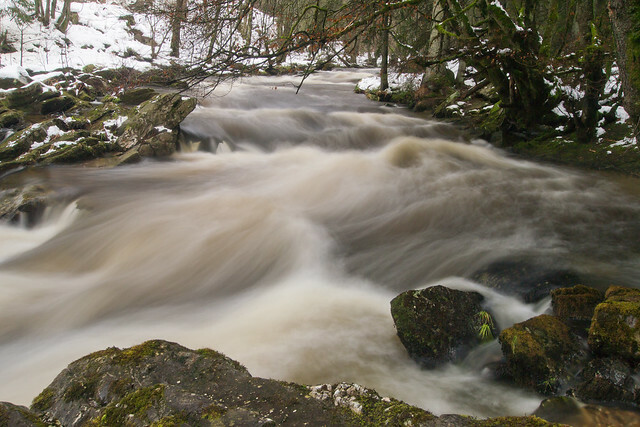 The Rur river upstream from Monschau.